In the Turkish tradition, the best-known early mevlût was written by the venerable Shaikh Süleyman Chelebi (may Allah sanctify his secret) of Bursa around 1400 CE. It is written in rhyming couplets, a literary form adopted from the Persian. Its rhythm is simple; the meter is the same as that used primarily in Persian mystical and didactic epics such as Imam Faridu-d Din ‘Attar’s Mantiqu-t Tair and Mevlana Jalalu-d Din Rumi’s Mathnawi. The language is plain, almost childlike, and therefore the poem has not lost anything of its charm even today. Filled the world with light up to the sky. One stood upright on the Ka’ba’s roof. Men and djinn are longing for his face. This night, God shows mercy to the world. This night, gives the lovers a new life. That they gave me a sherbet in a glass. Welcome, O sunlight and moonlight of God, we welcome you! Adapted from: Schimmel, A. 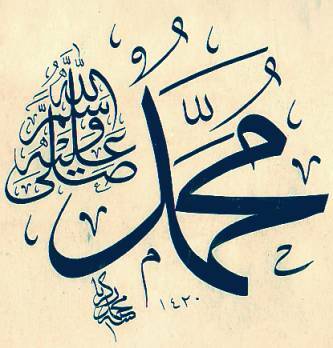 And Muhammad is His Messenger. Kuala Lumpur: Islamic Book Trust, 2008. Alhumduillah! Allahuma SalliAllah noor wa Allahe!